Trump’s outreach to black voters is a dog whistle for racists. And his outreach to black voters is a dog whistle for racists. Republican presidential candidate Donald Trump’s version of “black outreach” is anything but. Above, Trump on Monday in Akron, Ohio. It’s clear that Donald Trump’s “black outreach” isn’t actual outreach to black communities. A Trump who wanted to reach black voters would speak to black churches, black colleges, and organizations like the NAACP or the Urban League. The actual Trump, instead, has made his pitch to lily-white audiences in towns and neighborhoods with few black residents. And for good reason. Trump is never going to win more than a token percentage of black voters. If he wants the White House, he’ll need to persuade as many white voters as possible, and a visible commitment to diversity is one way to win over a certain class of right-leaning, suburban whites. Or at least, that’s my theory. And it fits the history of modern Republican presidential campaigns, where visible overtures to black voters were part of the process, from Richard Nixon in 1968 to George W. Bush in 2000 and 2004. But there’s a problem. In the past 24 hours, Trump’s message to blacks has gone from unusual—“you have nothing to lose”—to something on the border of racist. Listen to what the Republican nominee had to say to an almost all-white audience in Akron, Ohio, on Monday evening. As big a problem as violent crime is in the nation’s most segregated and impoverished communities, the world Trump describes doesn’t exist for the vast majority of black Americans in 2016. For them, as for most Americans, crime is at historic lows, and cities are safer than they’ve ever been. Which is all to say that Trump has taken his earlier appeal to black voters—or rather, his appeal to whites vis-à-vis blacks—and pushed it in a lurid and fantastical direction. 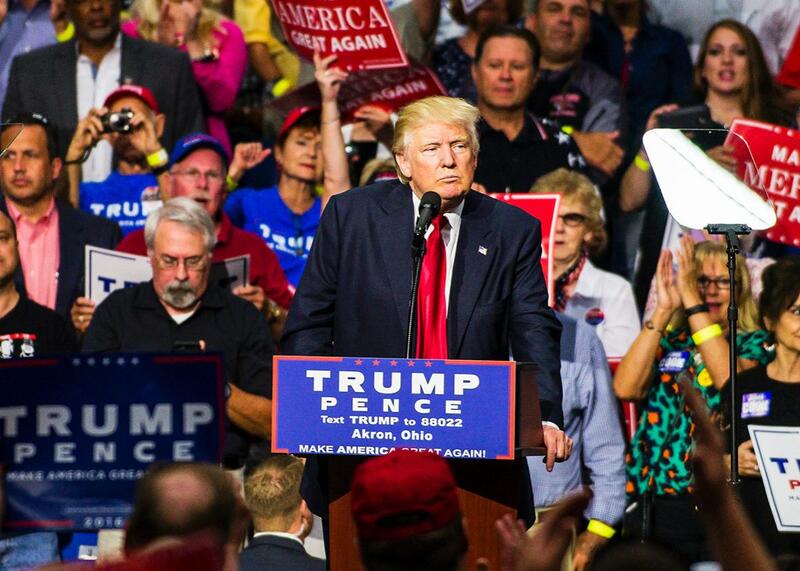 In Akron, Trump didn’t describe life for black Americans as much as he described a white supremacist fantasy in which blacks live miserable, brutish, and nearly subhuman lives in cities dominated by feckless Democrats. And he punctuated that fantasy with a call to vigilance for his audience, asking them to watch out for “fraud” in those same neighborhoods. “You’ve gotta get every one of your friends,” Trump said. “You’ve gotta get every one of your family. You’ve gotta get everybody to go out and watch and go out and vote. And when I say watch, you know what I’m talking about, right? You know what I’m talking about. I think you gotta go out and you gotta watch.” That Trump is referencing black communities is made evident by the fact that he first debuted this language after warning of voter fraud in the largely black precincts of inner-city Philadelphia. After the rally in Akron, in an interview with Bill O’Reilly, he elaborated on this rhetoric, with a promise to reduce crime by letting “tough” police take charge. “I know police in Chicago,” Trump said. “If they were given the authority to do it, they would get it done.” Trump didn’t specify “it,” but it’s worth noting that last year, Chicago created a reparations fund for surviving victims of torture carried out by the city police. None of this counts as “outreach” to black voters. But it also goes beyond traditional coded appeals to conservative whites. It sounds less like rhetoric from a Republican presidential nominee—or at least, rhetoric used in public—and more like a headline at Breitbart or other white nationalist forums and websites, where racist fearmongering is the norm and where black Americans and their communities are often portrayed in sensational and offensive ways. We’re a news cycle or two from Trump invoking the knockout game. There’s no question that he wants to win over white suburban voters—he needs them to have any chance of winning the Oval Office. But Trump is ignorant and undisciplined, with aides and advisers who swim in the shallow waters of nativism and white nationalism. His attempt to reach a different tranche of white voters through performative empathy for black voters has become, it seems, an outright appeal to his most racist and reactionary supporters. Those are the voters you reach with sensationalist descriptions of poor black neighborhoods, tirades against voter “fraud,” and calls for “tough” policing of black communities. That Trump has moved closer to anti-black rhetoric—an addition to his still-regular tirades against Mexico and Muslims—only underscores the extent to which his campaign is a vehicle for a resurgent and newly confident movement of white nationalists, whose influence on the Trump campaign is visible and unmistakable. And given the degree to which Trump has integrated these figures into his campaign, it was only a matter of time before black Americans were the target of his racist characterizations. At this stage of the election, polls are predictive. Barring the unforeseen or the catastrophic, Hillary Clinton will walk away from Nov. 8 with the presidency. But that leaves us with weeks of activity, and between now and then, there’s a strong chance—a guarantee, almost—that Trump will go further down this white nationalist rabbit hole, surfacing the worst of American life in the process.